[During an episode of the Mongolian Invasion of China, a few Mongol horsemen]…were so bent on conquest that they couldn’t be bothered to carry cooking utensils. Many didn’t even bother to carry food, since the villages they were conquering usually provided everything they needed. Story has it that eventually the Mongolians found themselves facing the Great Wall of China with no idea of how they might cross it. They settled down for a siege, but soon became hungry. None of the riders had cooking utensils, so they eventually decided to boil some water in a helmet. 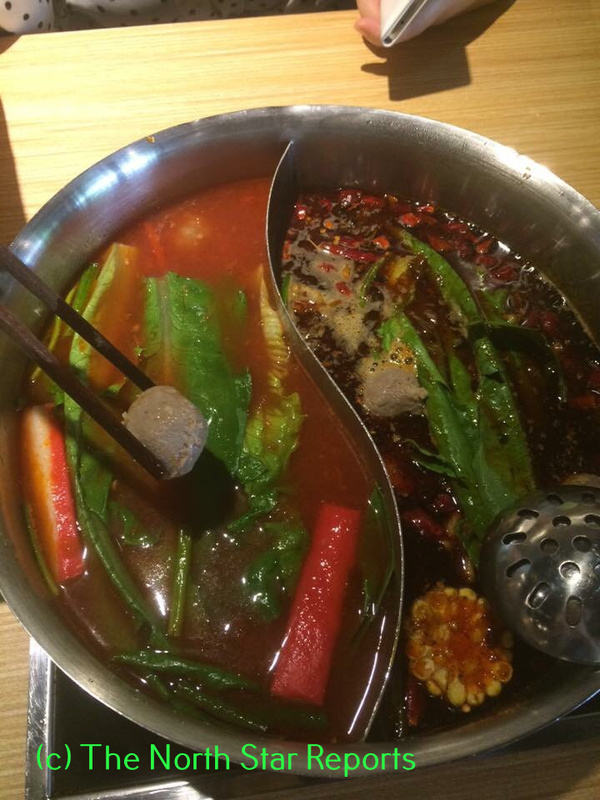 Bits of food were tossed in until they were cooked, and the hot pot was born. (akm20myonmi, 2016). Whether that story is legitimate or just a legend, hotpot quickly caught on in China and developed into an extremely popular form of cuisine that is still widely enjoyed today. 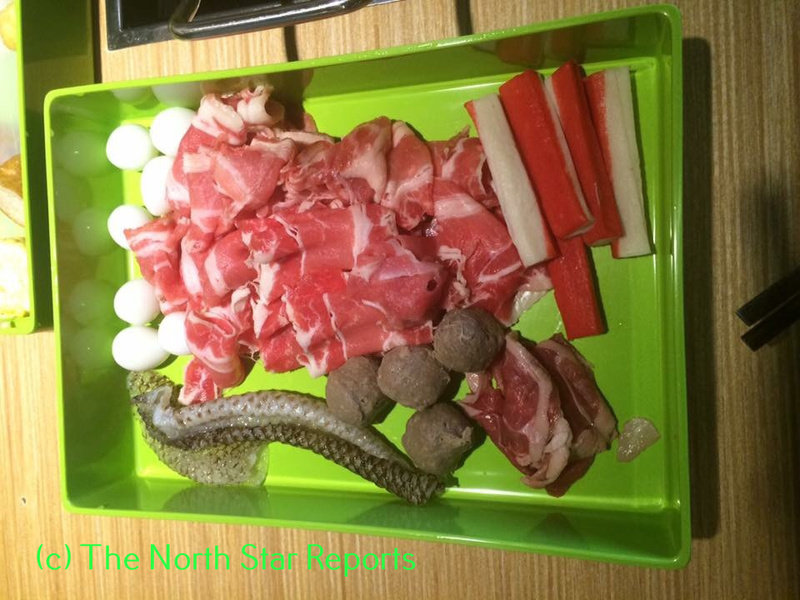 However, it is not a simple meal to prepare; rather, hotpot features a series of steps that need to be completed before indulging in it. When a group of people goes out for hotpot, they must first order a few big pots of broth (in my own experiences, my friends and I usually picked a tomato-based broth and a spicy broth heaving over with peppers). The dining table come equipped with burners, so once the broths arrive, the group of diners lets them sit on the burners until they start to boil. While they wait for that to happen (because as the old mantra says, “a watched pot never boils”), they select their food mix-ins and dipping sauces. 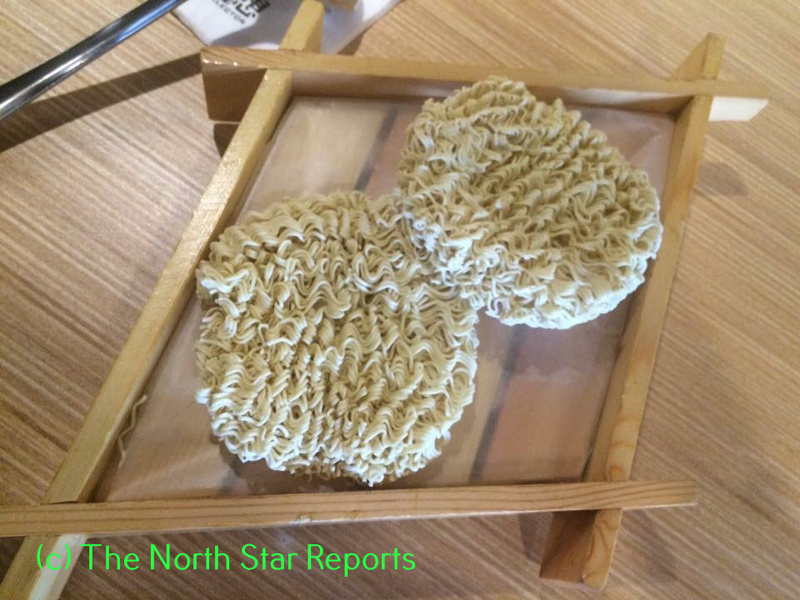 They can choose a huge assortment of foods to have with their hot pot; their options range from greens and vegetables, thin slices of meat, seafood, tofu, noodles, dumplings, breads…really, the sky is the limit. 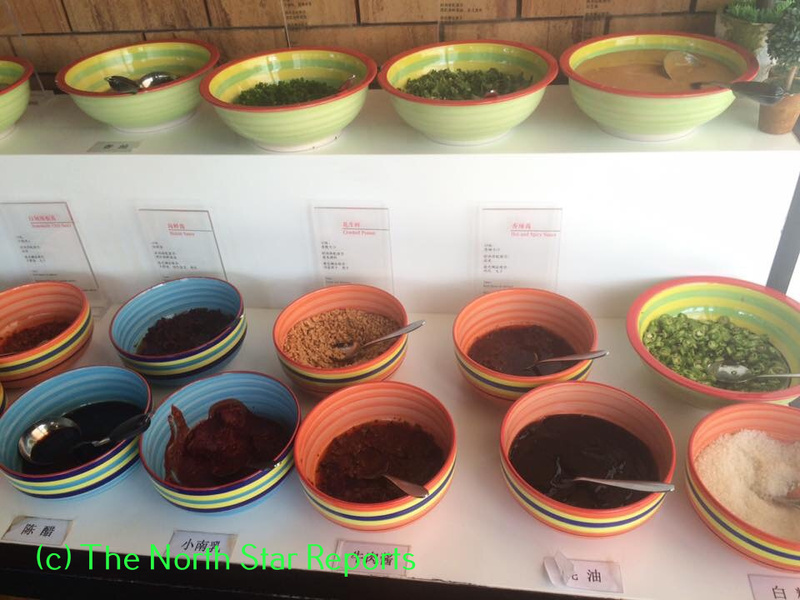 Similarly, they can customize the dipping sauces by brewing together creative concoctions at a sauce bar. Ingredients for dipping sauces include tahini, peanut butter, soy sauce, rice wine vinegar, chives, and even more garnishes that truly allow them to be mix-and-match maestros. Once the food mix-ins and sauces are gathered, the group plops the foodstuffs into the boiling broths until they are thoroughly cooked through. Then they pick up the submerged foods with chopsticks or spoons, dip them in their tailor-made sauces, and then gobble them up. They rinse and repeat this process, often with the accompaniment of white rice and plum juice to counteract excessive spiciness, until all the food runs out or the diners become too full to finish everything off (the latter scenario is much more common). 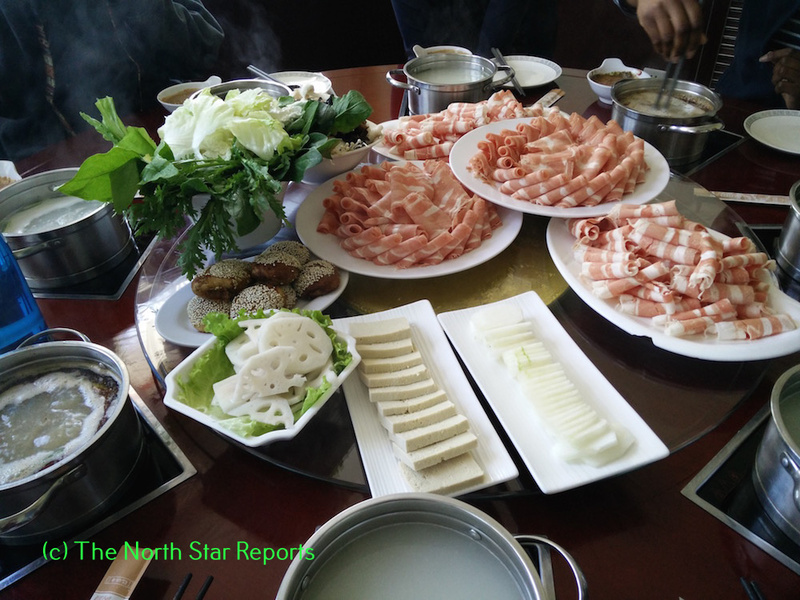 Hotpot is a very fun meal to eat due to its limitless possibilities, as every visit offers the opportunity to try new broths, new food mix-ins, and create new sauces. 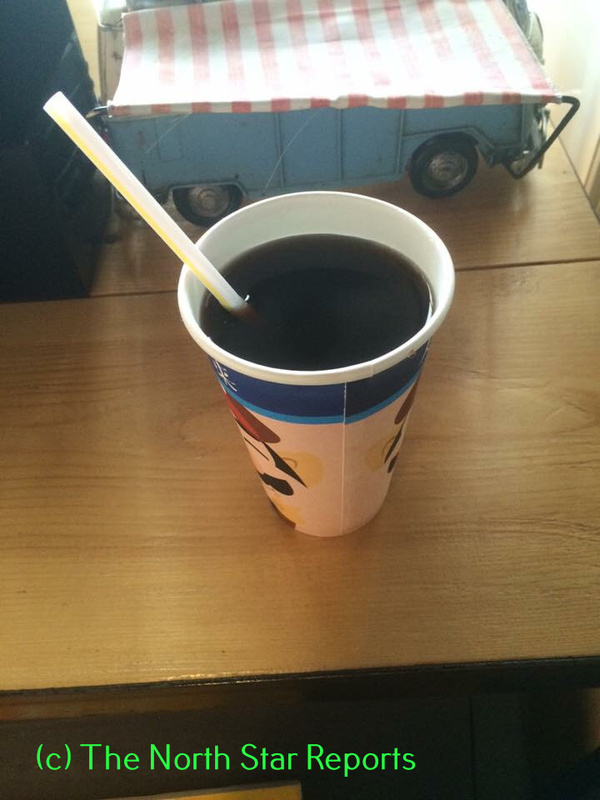 But even more than that, it serves as a great social activity. 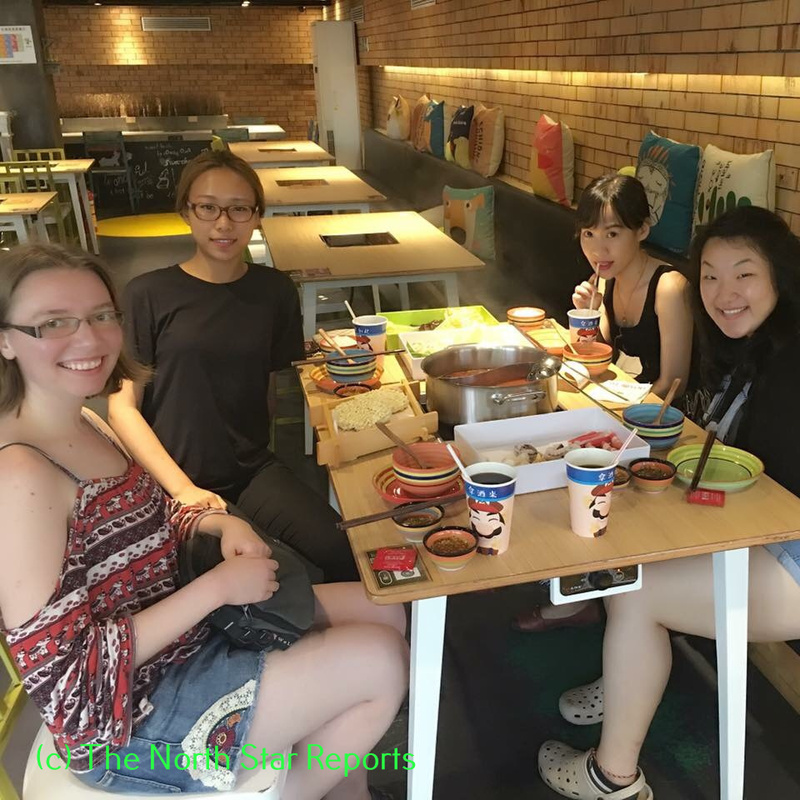 Hot pot works much better with large groups of people in order to vary the types and quantities of the ingredients, and is just simply a great way to bring people together to chat and catch up while they eat delicious food together. I personally had several wonderful opportunities to share hot pot with several of my closest friends, which served as some of the best bonding experiences during my time in China. I hope that many more people, whether in China or elsewhere, can further learn about and engage in this tradition so that they can try new food while making great friends! akm20myonmi. “10 Unique Facts To Know About Chinese Hot Pot. Tabelog.us.TABElog. 10 March 08, 2016. 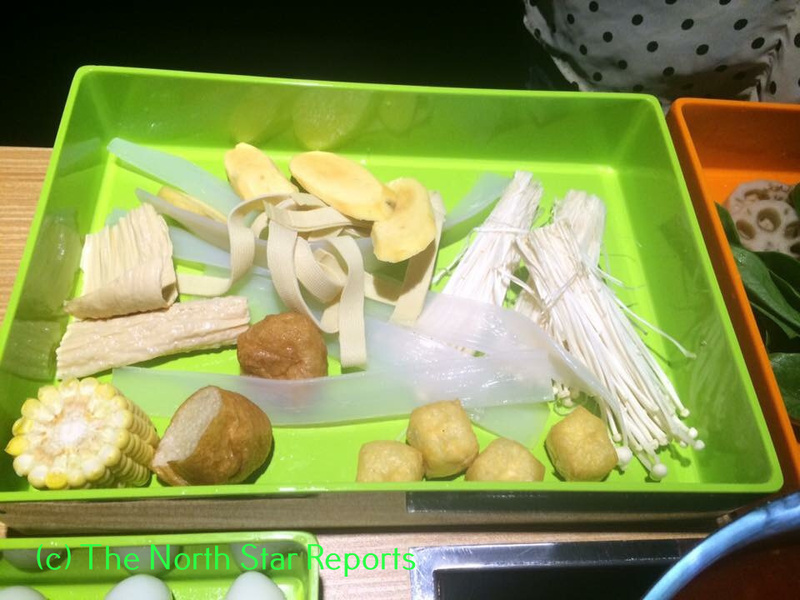 Accessed July 28, 2016. http://www.tabelog.us/articles/10-unique-facts-to-know-about-chinese-hot-pot. Vogel, Mark R. “HOT POT!” FoodReference.com. March 24, 2010. 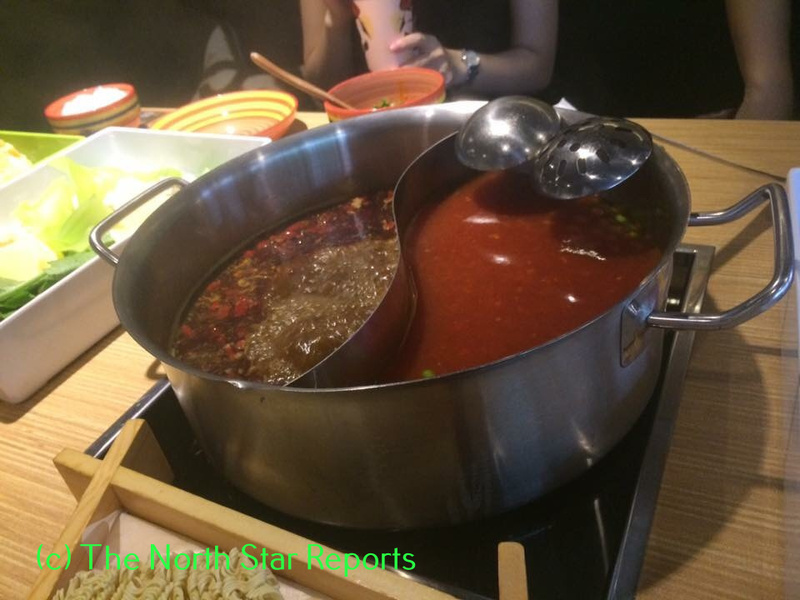 Accessed July 28, 2016. http://www.foodreference.com/html/chinese-hot-pot-a310.html. Wu, Annie. “Chinese Hotpot — A Popular Chinese Dish You Should Try.” Chinahighlights.com. China Highlights. July 21, 2016. Accessed July 28, 2016. http://www.chinahighlights.com/travelguide/chinese-food/hotpot.htm. [Image 1] Hot pot (火锅 huo3 guo1) seems to be everyone’s favorite meal, particularly on special occasions. During my time studying Chinese in Beijing, our program would take each class to a local restaurant after the weekly Friday exam, and would treat us to lunch while we chatted with our classmates and teachers about things outside of course material. Because my class and the class directly above mine both had a mere two students each, we joined forces on Fridays and invited two office staff members, bringing our group total to about eight people every week. 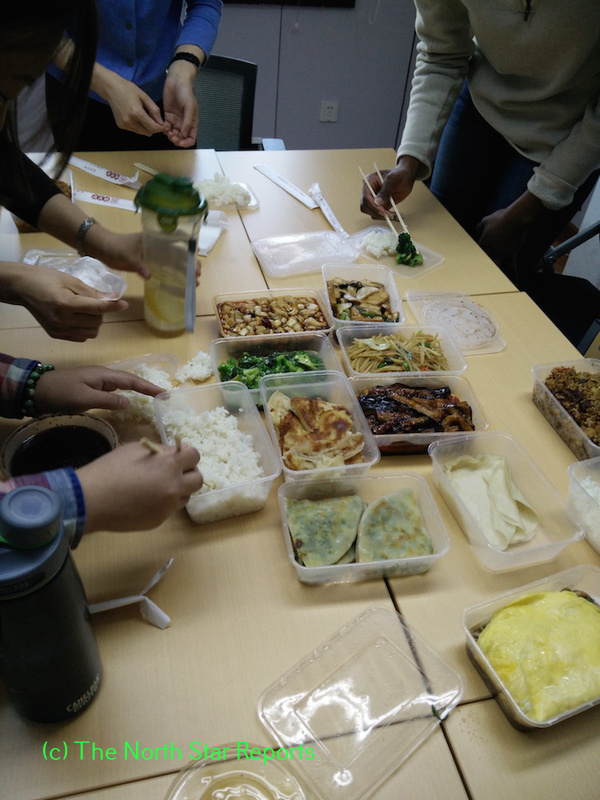 For every Chinese table, we would designate a different student to select a restaurant and reserve seats for our group—this way, we got to try all sorts of new foods from different parts of China. This is especially significant because in China, every region has its own distinct specialties, flavors, or even cooking methods, (their 特色 te4 se4). This is obviously different from restaurants in the US, where the variety comes not from different regions in America, but rather different nations’ cuisines. 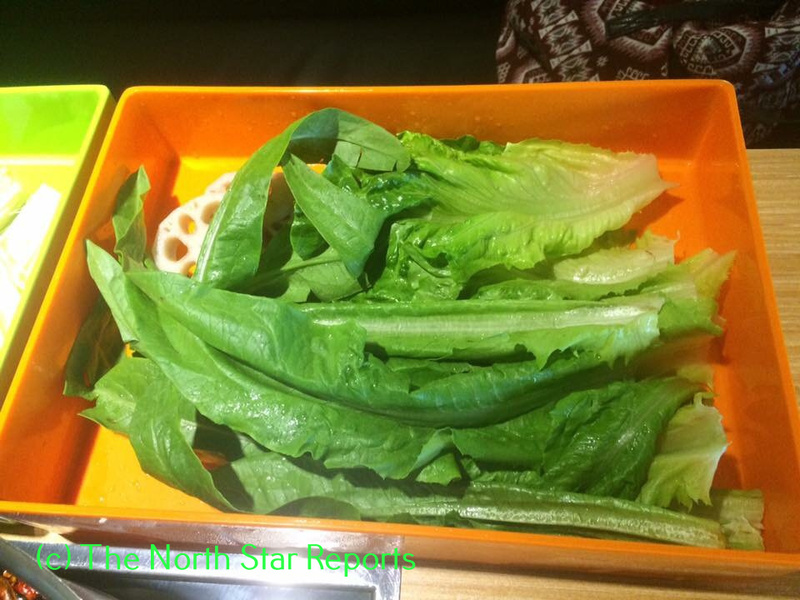 [Image 2] Just one portion of one week’s Chinese table meal. This particular restaurant’s specialty is donkey meat! I particularly love the Chinese table tradition at our program. Not only for the delicious (and free!) food, but especially because I get a chance to really get to know my teachers, and talk about all sorts of topics. And I mean, all sorts. Obviously in the beginning, when our Chinese was more limited, our conversations were much more simple. Towards the end of the program, we were able to move past topics such as “my hometown’s weather”, and cover more complicated areas of conversation, (such as instructions on how to prepare certain foods, or our future career aspirations, etc.). [Image 3] One week’s busy schedule forced us to bring Chinese table into the classroom! Even take-away meals can be shared. 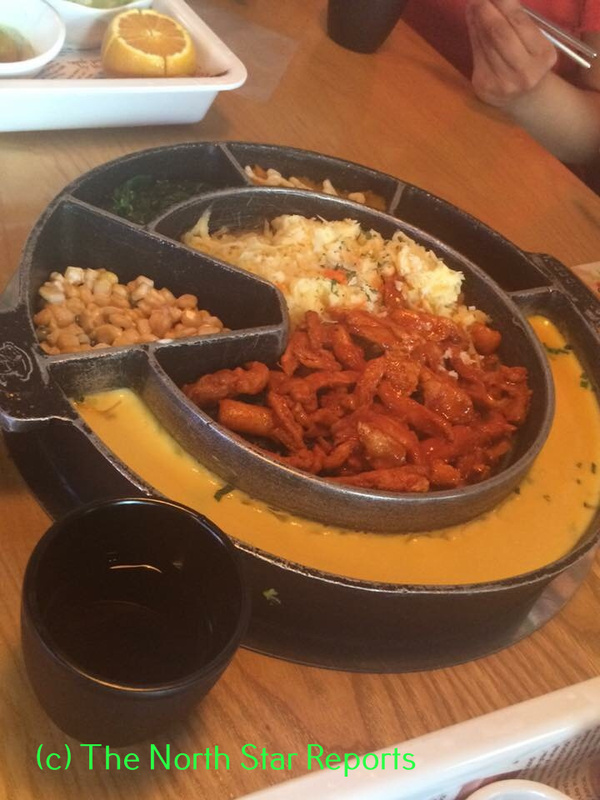 you go to a restaurant with a friend, you each order a separate dish, typically with individual sides included. 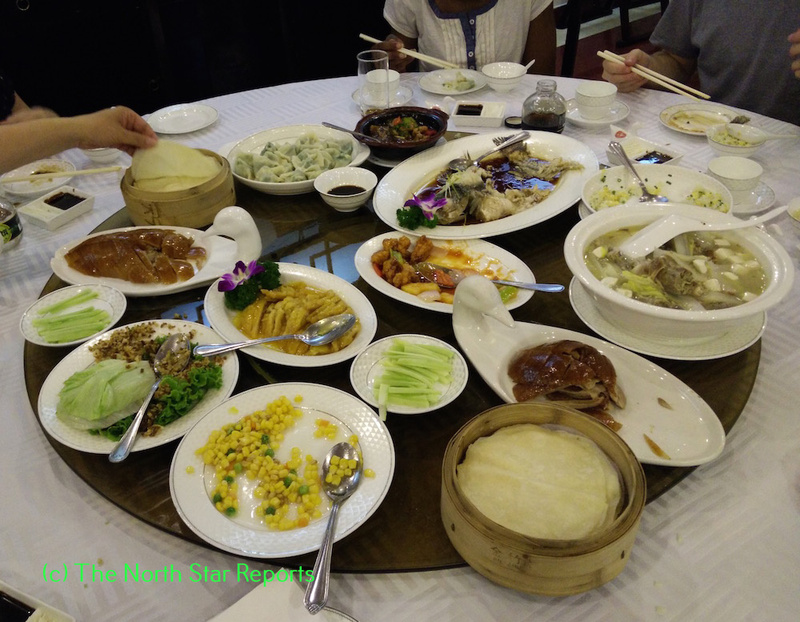 In China, if you go out with friends, you each order what you want, and you share what you ordered with the table, (if you’re in a bigger group there is usually a lazy susan involved). For a typical meal, you would order a bigger meat dish, and some ?? 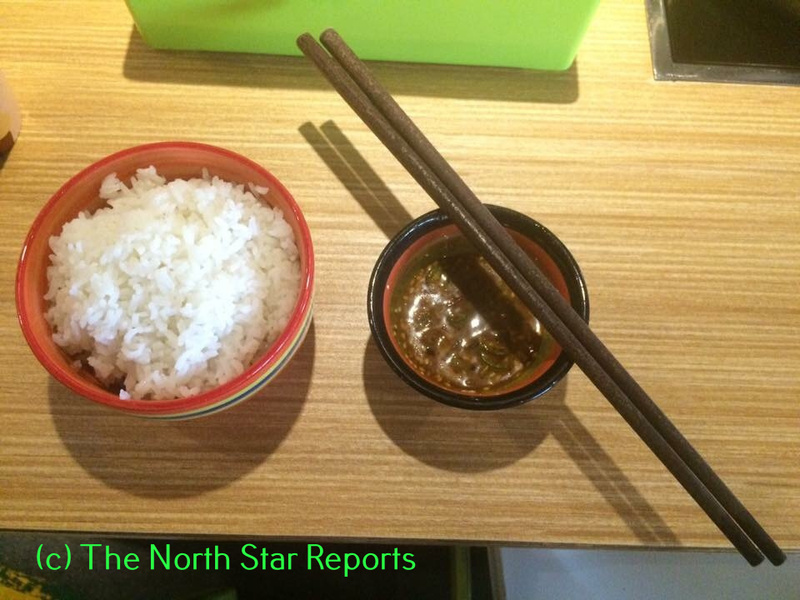 (su4 cai4), or veggie dishes (these can be hot or cold, and are usually side dishes). Finally, each person can choose to order a small bowl of rice to go along with his or her meal. 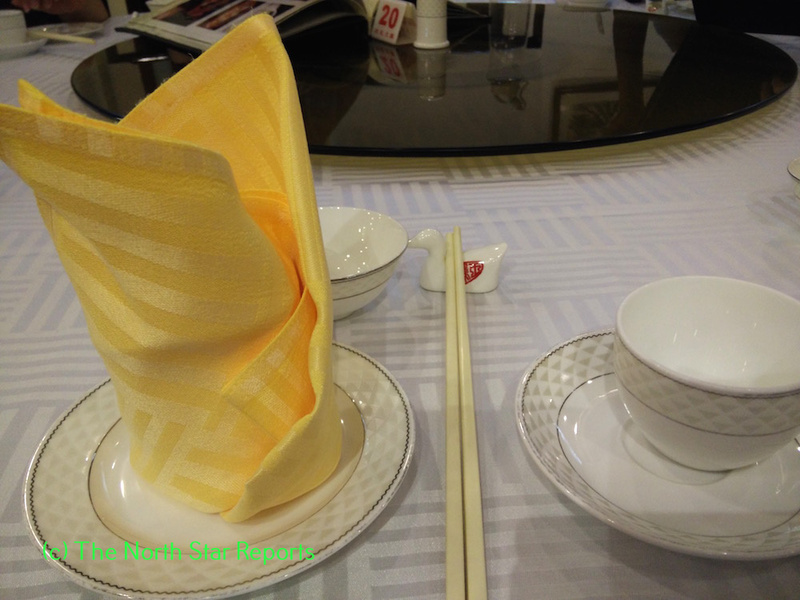 [Image 4] You can usually tell you’re at a Peking duck restaurant by the chopstick holders. Though each Friday’s meal was unique and delicious, my favorite meal was from our last Chinese table. Since our class saved up quite a bit from our weekly restaurant budget, our teachers thought we should go somewhere special for the last Chinese table. After throwing around some ideas, we finally decided on a local Peking duck restaurant. 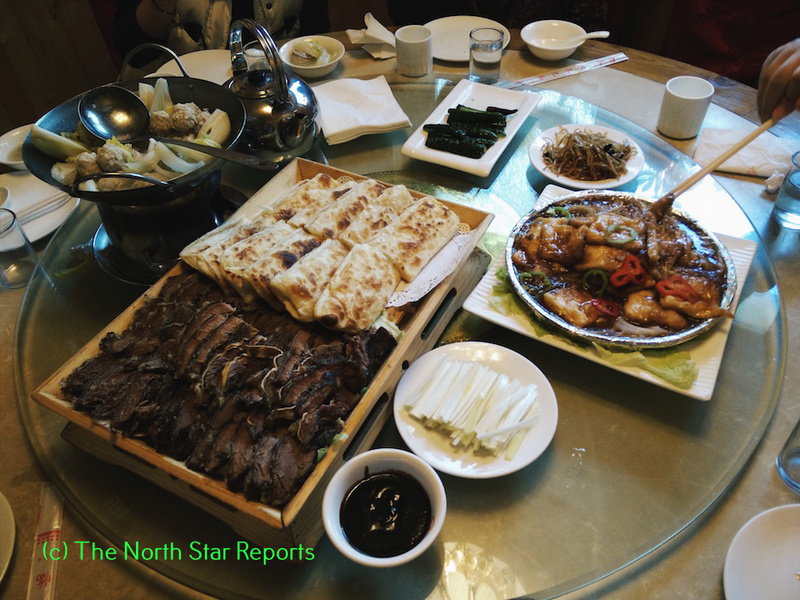 [Image 5] Sitting around this beautiful spread of delicious food, we reflected on our growth since the last time we all ate Peking duck together, during our very first Chinese table in Beijing. Based on these descriptions, one would assume that this place would be the most Russian of Russian cities. However, these are actually some of the key sights to see in Harbin, a city located in the northernmost throes of China! Harbin, the capital of China’s northeastern Heilongjiang Province, offers a fish-out-of-water experience and a standout highlight of any expedition into China. The city of Harbin as it is known today dates back to the end of the 19th century – a spring chicken as far as most Chinese cities are concerned! The Russian Empire was consolidating ownership of its Siberian reaches via the Trans-Siberian Railroad and wanted a shortcut route to Vladivostok, its key Pacific port. The Qing Empire ruling China at that time granted Russia permission to build the Chinese Eastern Railway in its territory. Construction lasted from 1897-1901 and during that time, hundreds of Russian workers and railroad personnel settled in the area. They ultimately decided to remain there even after they finished building the railway. Noting Harbin’s steady growth following this settlement, China declared Harbin an “open city” in order to further promote trade opportunities. Hundreds of immigrants, chiefly from Russia but from other countries as well, flocked to Harbin to help and build up this rising economic centre. 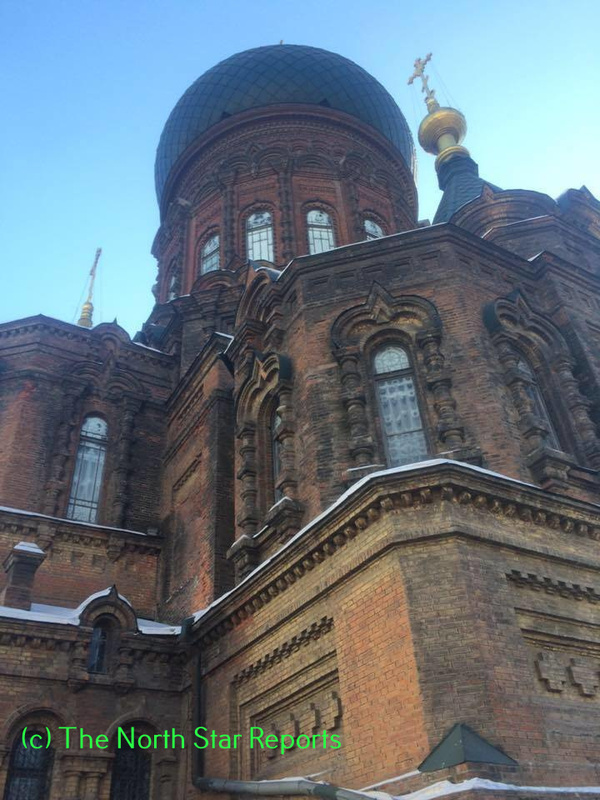 Harbin also offered a safe haven for people under persecution, and thus groups such as Eastern European Jews and Russian dissidents of the Bolshevik regime relocated to Harbin as a place of refuge. The influx of people and businesses helped Harbin carve out an identity as an eclectic and bustling city; nicknames such as “the Paris of the Far East” and the “Moscow of the Orient” provide further testament to its cosmopolitan reputation. However, these glory days were not meant to last. China’s regional neighbor Japan had been demonstrating its imperial expansionist ambitions and invaded northeastern China in the 1930s. Japanese occupation proved devastating for Harbin; the Japanese army’s control of the city’s transportation hubs was a massive blow for its economy. Additionally, thousands of residents in and near Harbin fell victim to Japanese biological warfare experiments that were being tested at this time. After the Japanese were expelled from Harbin following their defeat in WWII, members of the Chinese Communist Party entered the area and Harbin became a key base for Communist forces during the Chinese Civil War. After the Communists’ victory and the establishment of the People’s Republic of China in 1949, Harbin returned to Chinese rule and began a new chapter in its history. 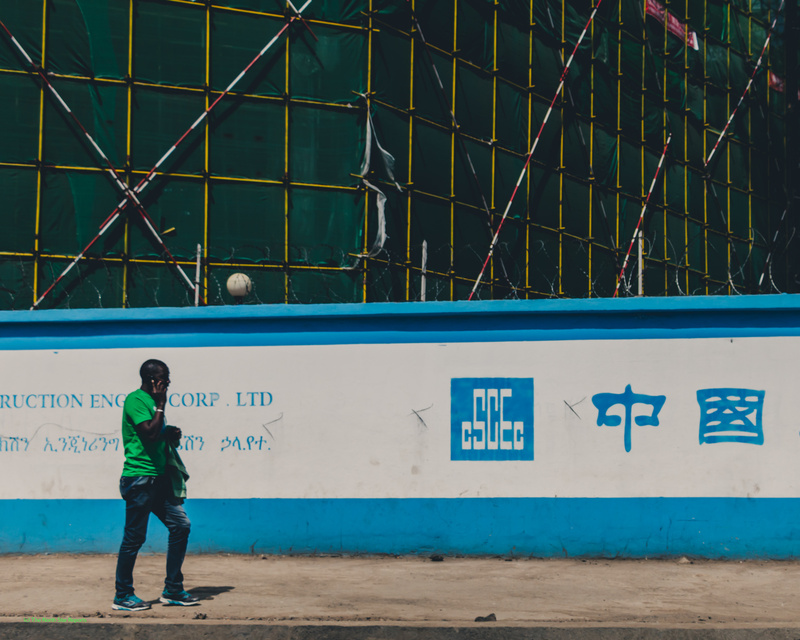 Over the next few decades, the Chinese population of Harbin substantially increased as the Chinese government promoted it as a base of heavy industry. Simultaneously, the Russian population steeply declined due to mass outward migrations to escape Japanese and Chinese control, Soviet deportations, etc. 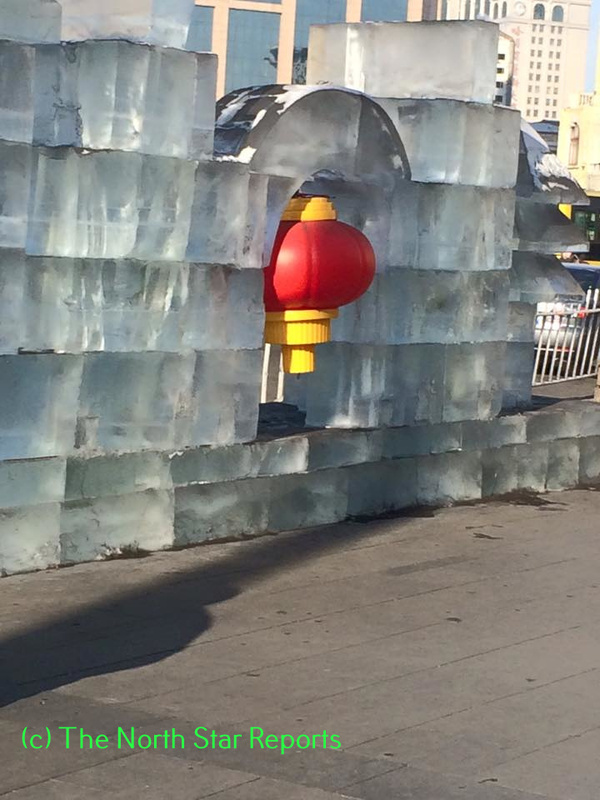 In terms of cultural and demographic terms, Harbin today is much less ethnically diverse than in times prior. 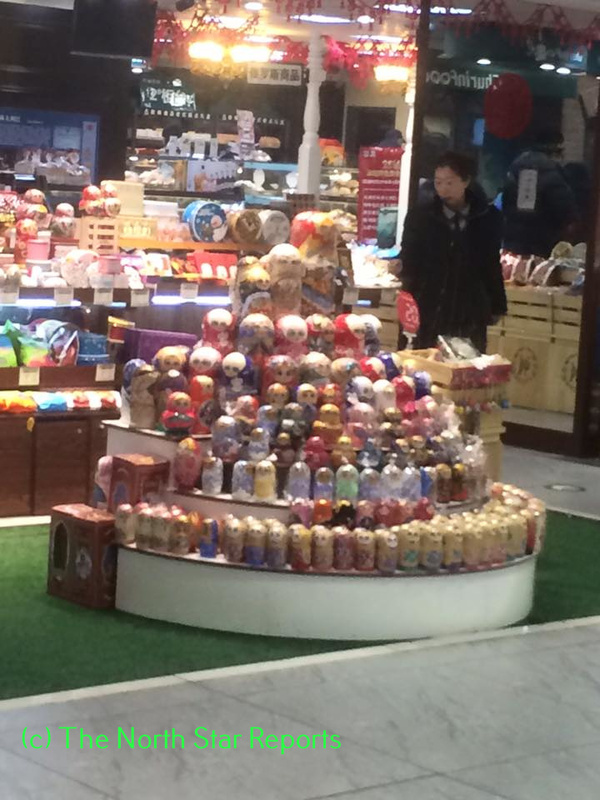 Despite these significant changes in Harbin’s make-up, the influence of Russian culture is still clearly evident in several aspects of day-to-day life, such as architecture, monuments, merchandise and foodstuffs, etc. Furthermore, while Russian and Chinese influences are most predominantly visible in Harbin, other cultures have further added to the city’s cosmopolitan flair. The Harbin Jewish New Synagogue Museum is the most prominent remainder of the Harbin Jewish community’s legacy. 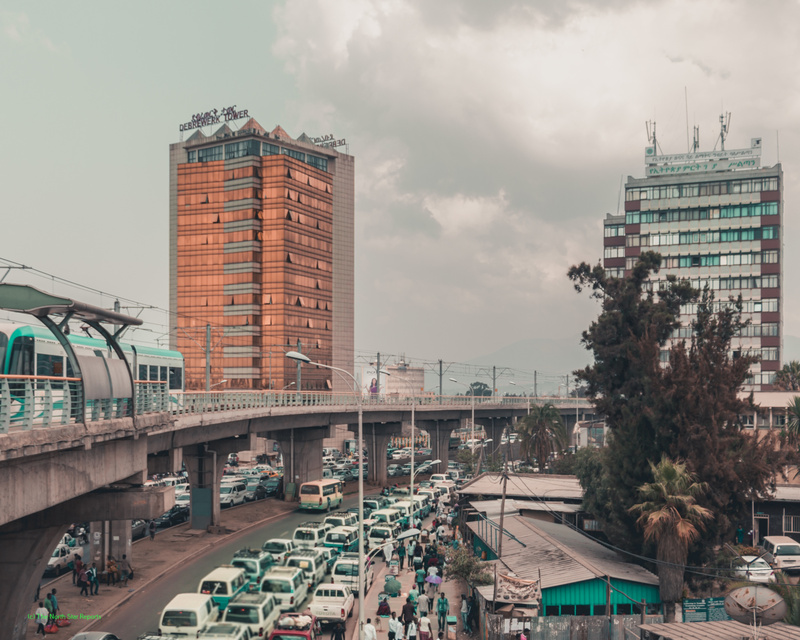 The city features the Daowai Mosque, and ethnic Uyghur and Hui people that form part of China’s Islamic minority operate several restaurants and noodle shops. 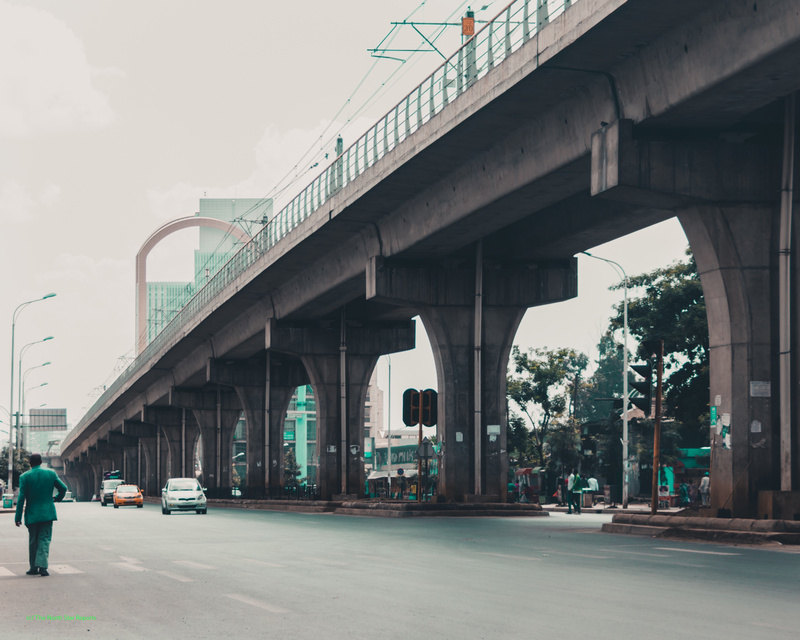 The streets are dotted with Thai, Korean, and Mongolian restaurants, and the city even features an ornate Indian Quarter! All of these details blend into the background of the cityscape yet offer tantalizing hints to the mosaic that is Harbin’s identity. 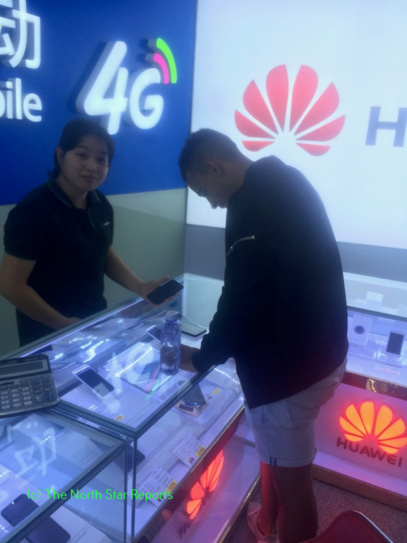 With all of these factors in mind, Harbin is a centre of multicultural synthesis in China and a very worthwhile place to explore further in depth! China Briefing Media. China Briefing’s Business Guide to Beijing and North-East China. China Briefing Media, 2006. Accessed April 25, 2016. https://books.google.com/books?id=M2TvFN9DmqkC&pg=PA211&lpg=PA211 &dq=harbinopencity&source=bl&ots=EkeKrpus6W&sig=uPf5JqrwgsG_8TPF76 Vi3paHcUc&hl=en&sa=X&ved=0ahUKEwi0x_3hn6fMAhXDYqYKHbgMBKc 4ChDoAQgcMAA#v=onepage&q=harbinopen city&f=false. Encyclopædia Britannica Online, s. v. “Harbin”, accessed April 24, 2016, http://global.britannica.com/place/Harbin. “Harbin Travel Guide.” Travel China Guide. Accessed April 24, 2016. https://www.travelchinaguide.com/cityguides/heilongjiang/harbin/. King, R. Todd. “Harbin’s History.” RToddKing.com. 2005. Accessed April 24, 2016. http://www.rtoddking.com/chinawin2005_hb_hi.htm. Song, Candice. “Harbin History.” ChinaHighlights. July 28, 2014. 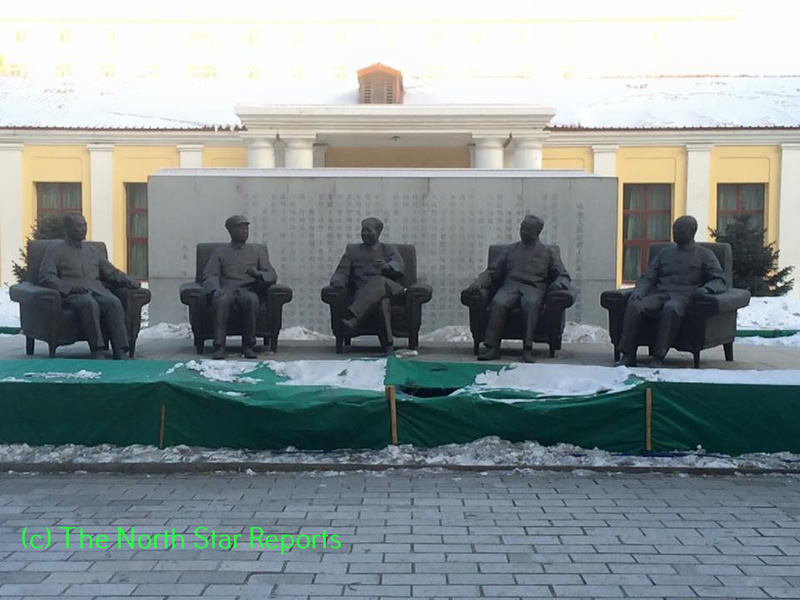 Accessed April 24, 2016. http://www.chinahighlights.com/harbin/history.htm.